Here’s a jpg of my latest art project for Hickory Nut Gap Farm. 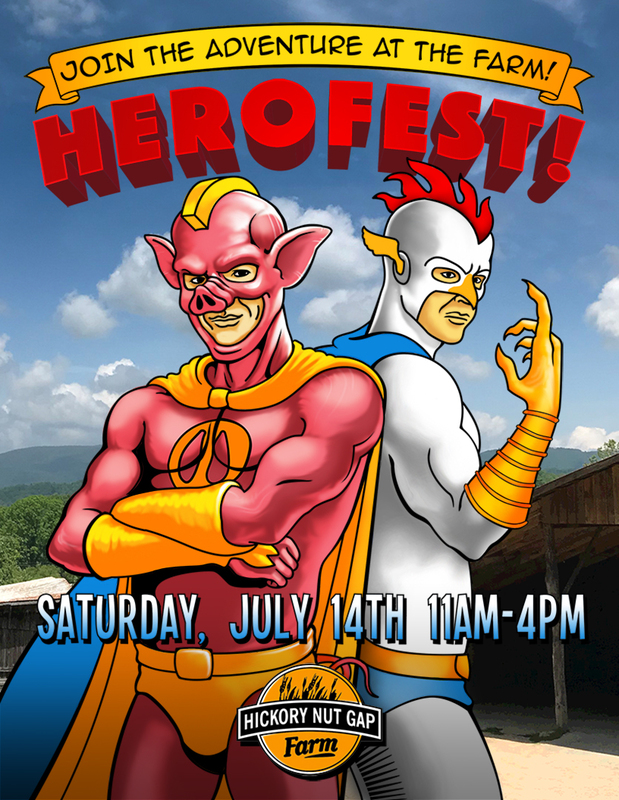 We’re having a HEROFEST event at the farm. I’ll leave the full explanation of the event to be announced by the Event Organizer, but it’s bound to be a lot of fun! It’s planned to be an open-concept, Comic-Con type event combining agritourism, health and wellness, visual art, capes and glitter. Stay tuned for more info on this wild event! I’ve been doing a lot of illustration and painting with Adobe Illustrator and Photoshop using a collage of vector and raster graphics. I’m using a small Wacom drawing tablet that I bought to test whether or not I’m comfortable with freehand digital drawing in a digital space… I know it’s not for everyone, and there are a lot of strong opinions on either side of the subject, but I’m enjoying the process and it feels natural after adjusting to the differences between digital space and traditional drawing on paper. Some of the digital abilities are mind-blowing, like the ability to undo actions, duplicate, mirror, work on multiple layers, and save an endless variety of versions for a project. I’ve been making the most of my recent downsizing and “de-materializing” (meaning: throwing out/giving away old, hoarded art project materials and supplies) by doing more digital work. The supplies, workspace, and cleanup are all a breeze compared to the musty, sawdust sprinkled concrete basements and garages I’ve been working in for the last couple of decades. I’m enjoying having a more streamlined lifestyle and not being weighed down by bulky piles of framing wood, boxes of rusty scrap metal and backlogs of blank, primed canvases (I have held on to a few… there are certain qualities to atomic, handmade artwork that are undeniably indispensable). This ongoing process of downsizing has helped me prioritize what things to let go of and what to hold onto, and I highly recommend it to anyone feeling creatively “stuck.” You will likely find, as I have, that I am not my material possessions and I am not my job description. 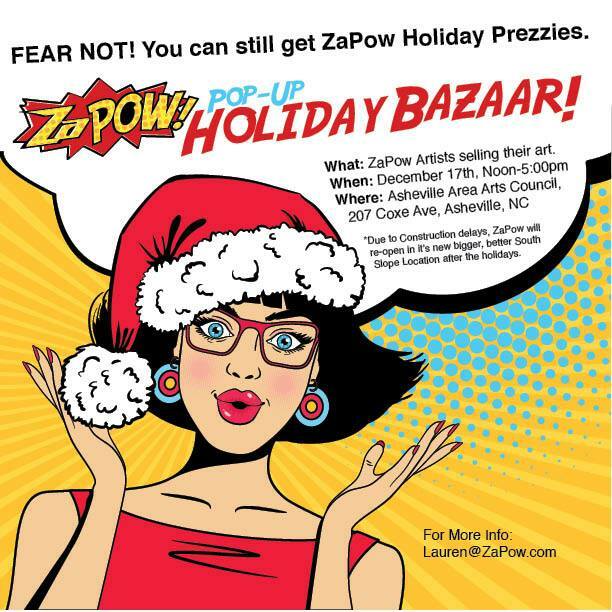 I was glad to be able to participate in the ZaPow Pop-up Holiday Bazaar this past Saturday! This Bazaar was put together by ZaPow! Gallery to help artists have some way to show artwork during the holidays as we await completion of construction for the new gallery space on the South Slope in Asheville, NC. It was great meeting a bunch of ZaPow artists, many for the first time in person, and seeing their amazing artwork. 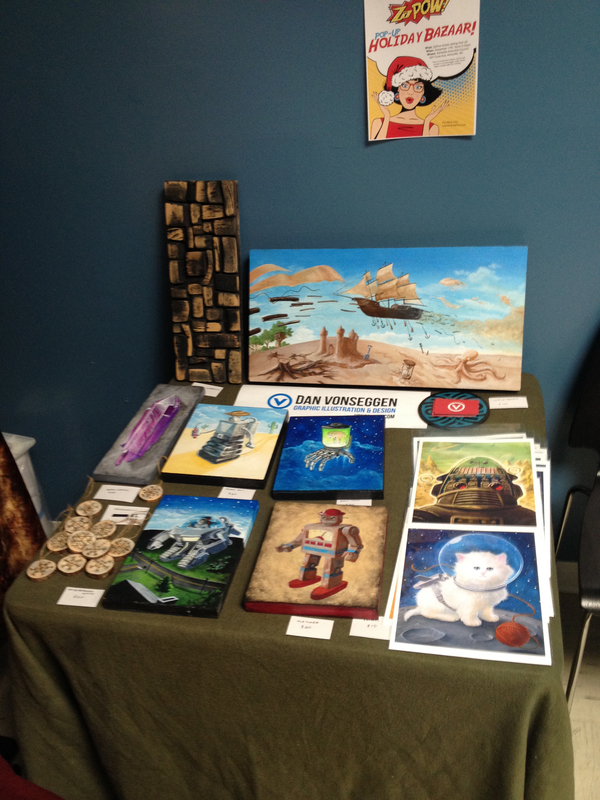 Here’s a shot of my table at the Arts Council. I have so much to learn in the ways of booth presentation… plenty of room for improvement! I’m considering this the “before” pic of my booth. I want to do a lot more booth-style shows in the future. I really like showing my art in this personal way and having conversations with people who stop by. I also look forward to growing more as an artist, both in techniques and choices of subject matter. There are so many opportunities to build and/or find displays for prints and 3D displays for small handmade items I make. I came away with a lot of good influences and ideas of how it could go smoother for the next event. Channel One Magazine came from the age of toner, sharpies and white out. In 1997, I worked at a local copy center and I had recently finished with graphic design school. My head was full of a collage of subjects I aspired to use for creative expression: creative writing, illustration, photography, and desktop publishing. I was really into fringe culture and the arts community of Winston-Salem, specifically people who frequented the original Morning Dew Coffee Shop on Burke Street, run by Steve and Ginny. It was a small community of the downtown area’s creative people and a place where I found myself spending a lot of time as I traded one past life for a newer one. I wanted to be a part of that community and help promote it. All of this translated into starting a zine; a cultural phenomenon that for the most part, has been replaced by the modern day blog. I’ve scanned the original folded, pasted, and taped-together master copy pages I used to make the first issue. I appreciate the contributions of all who were involved in making it happen and I hope it will be well-received by them as the time capsule it is. I had the pleasure of making this rustic signage for my friends at Triad Horticulture Club in early 2015. The client and I both liked the idea of using materials from the surrounding area, so the sign was made mostly with pallet wood collected from the grounds around the business. I built the main frame for the sign out of purchased, pressure-treated wood for factor-of-safety and wind shear concerns. The face of the sign was made with pallet wood, which is expected to weather and fade over time for added effect. I managed to document the project from concept artwork to finished sign. 3. Applying boards to the frame. I was honored to paint sky murals on the ceilings at Mary’s Gourmet Diner on Trade Street, in Winston-Salem, NC. Appropriate, since I usually have my head in the clouds or I’m spaced out. Here are some photos I took before, during, and after painting. Mary is celebrating her 15 Year Anniversary this month, so this post is to commemorate the event and celebrate her continued contribution to our thriving downtown arts community.